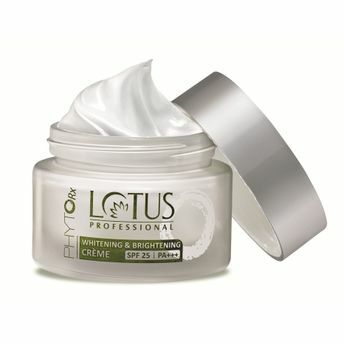 Get glowing skin with Lotus Professional Phyto-. This Creme produces a porcelain perfect complexion and smooth texture for skin. The revolutionary Tri-Action formulation based on Amla Berry, Lychee and Punarnava root extracts with a powerful sun protection mechanism works as skin's barrier against harmful UV rays. It regulates the production of melanin and makes skin visibly fairer by reducing dark spots, pigmentation and uneven skin tone. Contains the goodness of Amla Berry, Lychee and Punarnava Root. Regulates the production of melanin and makes skin visibly fairer. Reduces dark spots, pigmentation and uneven skin tone. Protects the skin as a barrier against harmful UV rays. Perservative Free, Potent organic formulation. Free from artifical fragrance and colour.